Digital Champions Day was held in UCC on June 7th 2016. The Digital Champions presented their projects and talked about their journeys with Technology Enhanced Learning (TEL) and the Transformation Through Collaboration Project in the previous six months. First to the podium was Prof. John O Halloran, Vice President of Teaching and Learning at UCC. John spoke of the importance of collaboration between institutes like those in the Transformation Through Collaboration Project, and how students deserve inspirational teachers such as the Digital Champions. Our guest speaker, Cambridge Professor John Naughton, had some excellent insights into the use of technology in a modern society. John studied Electronic Engineering at UCC and he describes himself as a ‘Techno-utopian’ turned ‘Recovering-utopian’. John spoke about how the internet is now ‘old’ technology which was a creation of the Baby Boomer generation. He encouraged people to change the way we talk and think about Information Technology (IT), to stop being intimidated by it and to recognise that there is no one size fits all when it comes to people and IT. The Digital Champions from UCC were then up to speak about their projects, and what they had accomplished over the last few months. Video definitely featured in these projects, from instructional videos for biology students, to using video as part of online geography courses, to filming introduction pieces to incorporate into mobile apps, there were a variety of examples on the use of video, as well as other TEL tools, in different teaching scenarios. After UCC, came the IT Tralee Digital Champions. There were many great projects presented on the development of Reusable Learning Objects (RLOs) for use by the careers service to enhance students online profiles for career development, and for nursing students practical skill development, among others. These Champions used the Articulate Storyline e-learning software to create their RLOs. IT Carlow really impressed with the variety of projects, from incorporating animation into lectures to increase student’s retention of key information, the use of Virtual Reality headsets in the classroom to increase students understanding of physics, peer assessment in computer games coding labs to increase student engagement, through to the comparison of Blackboard and Turnitin for grading assignments. After IT Carlow came a refreshing break and themed discussions on the use of TEL in teaching. During these discussions Padlet, commonly described as a digital canvas, was used to share resources, tips and tricks, and general advice by the participants on a number of themes such as collaboration, assessment, flipping the classroom etc. We reconvened to listen to Cork IT’s Champions present their projects. We heard Dr. Roy Sleater speak on the use of the GoSoapBox app in class. A mobile app which give’s real-time information on the student’s understanding of the lecture material. Roy spoke about the benefits of such a resource for large class sizes, where some students find it intimidating to ask a lecturer to go back over a certain topic or slide in front of so many other students. Zahid Aslam spoke about the use of mindmapping software in class as an alternative to powerpoint, and Thomas Broderick demonstrated different sporting apps which helped his Sports students coach their prospective clients in sporting techniques. The final group of Champions to present came from Waterford IT. Again, there were a wide variety of projects from the use of cards as an interface in Moodle for teaching second languages and also using Moodle for online peer and self assessment for nursing students and evaluating students’ attitudes to this type of assessment as part of blended learning. 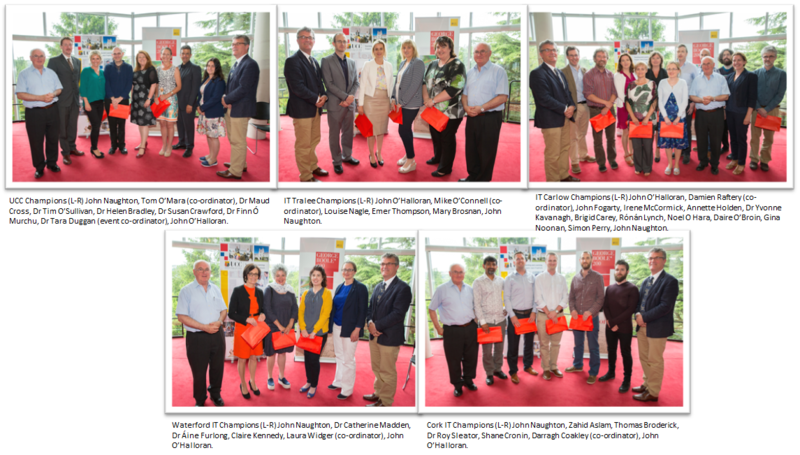 After all the institutes presented, Professors John O’Halloran and John Naughton presented each Champion with a ‘Digital Champion’ Digital Badge. These badges celebrate and award the hard work completed by our champions over the last few months. These digital badges are a great accompaniment to the project as they are designed to be used and shared online on a variety of social media and ePortfolio platforms. John O’Halloran and project co-ordinator Tom O Mara summed up the day with some closing remarks of thanks to all the project partners and Champions for all their hard work and contributions over the past few months, encouragement to continue collaborating into the future and a reminder that we owe it to our students to continue challenging and transforming our teaching. Photo by Tomas Tyner, UCC. For what purpose did you incorporate TEL into your teaching? I hoped to use TEL as a means of facilitating a flipped classroom approach to spectroscopic analysis. The two main goals were to make the pre-classroom videos more interactive and to incorporate analytics to track student engagement. Following discussions with the Instructional Design Team in UCC, we decided that Articulate Storyline was the software package best suited to this project. After initial training sessions, I set about embedding Panopto videos into Storyline and then splitting the videos into short 3/4 minute segments. I next interspersed these segments with short quizzes. The quiz questions related directly to the preceding video segment. The package was designed in such a way that only on correctly answering each question was the student able to progress to the next section. What were the benefits of this TEL tool? Storyline is a very flexible tool for creating interactive video packages and it doesn’t require any programming skills. The layout is broadly similar to PowerPoint which makes it relatively easy to find your way around the menus. There are several question styles available in Storyline which allows you to bring incorporate a variety of questions. Lastly, Storyline can export content in SCORM format, which is compatible with the major VLEs (e.g. Blackboard, Moodle). This SCORM package links directly with the VLE grade centre, making it very easy to track student engagement and determine exactly how many students have completed their pre-classroom work. Building up interactivity in Storyline requires the use of layers, triggers, variables etc. which are not especially intuitive at first. It does require some practice and trial-and-error in order to make full use of it. What advice would you have for someone else wishing to use this tool? 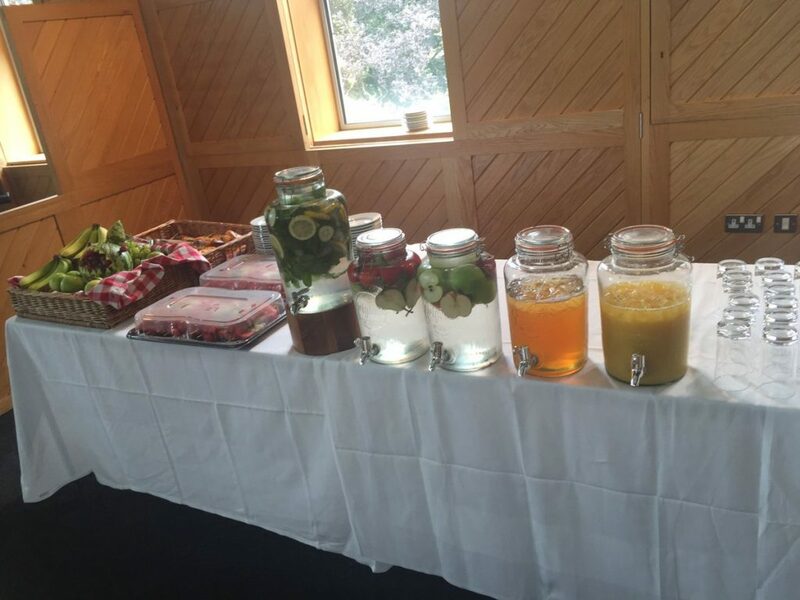 The training provided by the Instruction Design Team was hugely beneficial. There is also an active online community using Storyline, many of whom are willing to share their Storyline creations. It is well worth checking these out as basic blueprints for your project – no point reinventing the wheel! 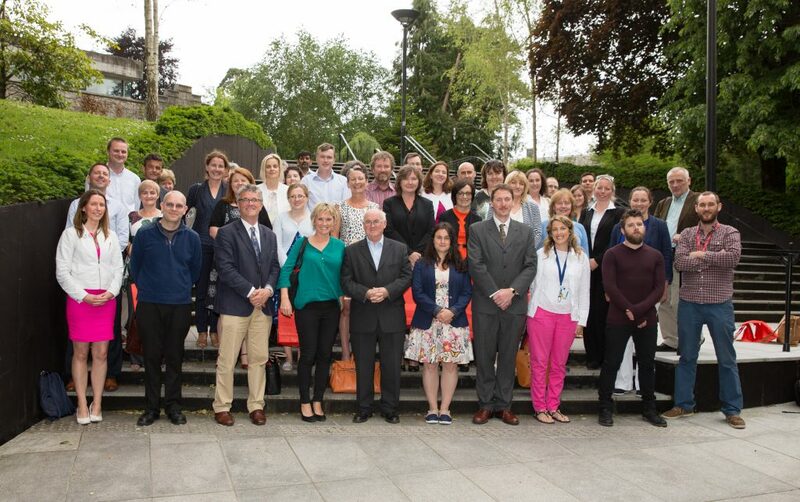 We had a fantastic Digital Champions Day on June 7th with Champions from all Institutes presenting at University College Cork. Check out this video to get a glimpse of the day, the Champions and their projects. In this project I am investigating the benefits of using Blackboard and Turnitin for grading and feedback both from the student and the lecturer perspective. From the student perspective, I found that initially students had a negative attitude towards Turnitin and viewed it only for originality and not grading and feedback. In a short survey 68% of students would prefer to use Blackboard for grading and feedback. One of the reasons for this may be due to access, in Blackboard the student have to click an icon in grade centre. In Turnitin the students needed a video to explain how to access the feedback, this does not help the student engagement with the process. 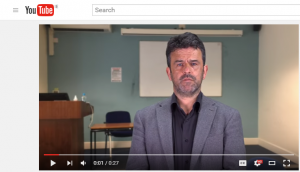 From the lecturer perspective, I have been using Blackboard for grading and feedback for a few years, I find that Blackboard is not very user friendly for giving feedback however the grading is easy to use. Turnitin in comparison is a lot more user friendly for giving feedback as I am able to save the QuickMarks and re-use them on other assignments but the grading was a little confusing. I am not sure how well the student engaged with the feedback as I noticed in Turnitin 25% of the students did not view the paper. Both systems suffer from the fact that the student can view the grade without accessing the feedback. In conclusion, I had not experienced the use of Turnitin prior to this project, the learning curve has been very steep and I still have some way to go with regard to both applications. I received training from the T&L centre which proved very useful and as this is an on-going process I expect that I will need their advice again. It is a key digital literacy tool for formative and summative feedback especially for students who engage with the process and for lecturers who will save time using this technology to enhance student learning. On June 1st Waterford IT Digital Champions presented to their colleagues on the projects they had taken part in for the previous six months. We hope that these type of local events will encourage other academics to pursue the use of technology in their teaching, like our Champions have. To see these presentations, click on the video below. It’s been a great experience working with Turnitin over the last few months. Admittedly at the beginning of process the thoughts of learning a new skill and trudging through training and trial-and-error situations was not an appetising prospect, but when I committed to the project it all took off nicely. I did the Turnitin grading online training in March. Grading via Turnitin is a bit like an arts and crafts project that you get dug into and don’t see the time flying by. I enjoyed the detail involved. I like the detail. I’m a bit disappointed that grading using Turnitin didn’t save time. Sort that out lads! In fact it was time consuming. Perhaps next year will be faster. The latest from the students is that they like it. They like it quite a lot. They have control and custody of the feedback. It’s in a safe and accessible place that they can revisit, if they wish. Next year I will develop the system and offer audio feedback for sure. That will be brilliant. I didn’t do that this year as there was too much new stuff going on and I didn’t always have my proper headset to hand. I did try it with a repeat student but she couldn’t seem to access the audio. I hope that isn’t going to be an issue next year. Overall it has been well worth the effort; the students have endorsed the use of Turnitin to grade their essay papers. Having said that, the majority would still like the option of supplementing the Turnitin quick marks with a talk with their lecturer. I understand this but I’d say this will be a minority of students especially if I get the audio thingy going. Bye, bye stacks of scripts travelling around Ireland in my boot. Hello grading online! What technology did you use for teaching and learning? I used screen casting software to prepare short youtube clips for my students. The clips supported the computer lab sessions on a project management module. What appealed to you about using this technology for teaching and learning? It enabled the student to revise the work done in the computer lab. It also allowed the more experienced students establish if they had the skills required for the lab assessment. It is a supporting resource available to my students as well as the lab sessions. The students use the videos to prepare for the lab exam. Additionally it means many students can revise without downloading and installing the free trail version of the MSProject – they use the videos instead. What do you think are the main benefits to using this technology? The weaker students have a resourse that allows them prepare for the lab exam. The stronger students can use their time more strategically. What do you think are the main drawbacks to using this technology? There are no drawbacks for the student – they can chose to use the resource or not. For the lecturer there is an upfront time investment but the return on this investment is felt over a number of semesters / academic years. A further challenge is when Microsoft / CIT upgrade the software, if there are significant differences then the videos may need to be re-recorded. This is a challenge. Try one video first – once you get one done it is easy to keep going! The students love it so the feedback will motivate you. media tutorial designed to enhance the digital learning experience of DF students when finding, using and managing information during their academic studies. 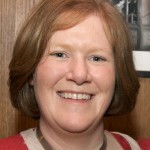 Information literacy can be a challenge for students particularly when using digital resources. For many of the DF students, their use of library resources is primarily off campus thus their learning experience in terms of using library online resources is challenging. 6 weeks later the DF team spent a day working with IT Carlow (21.04.2016). Proposed tutorial content and design was evaluated and refined. IT Carlow Library staff also gave a library tour to our DF Library colleagues. 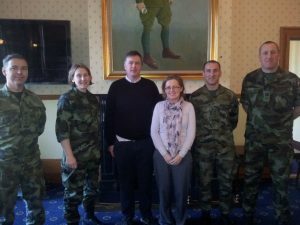 Our project dynamic is perhaps, slightly unique in that most of the other participants were individuals, whereas we had a team of four in IT Carlow and another team in the Defence Forces. We had to ensure that the project was managed in the context of these teams. The team format did enable us to include different perspectives on the task in hand. It provided a rich shared learning experience. The development of skills in using various software packages also proved to be invaluable. Working with our colleagues in the DF provided a unique opportunity for us to interact with group who have distinct requirements in terms of their information literacy provision. Library staff had to develop new skills to create online tutorials. The development of these skills while significant were ultimately worthwhile and has produced a template for the preparation of future online information literacy support packages for other cohorts within the Institute. The final stage reached in the project which is where we are now is the testing and final client feedback phase. 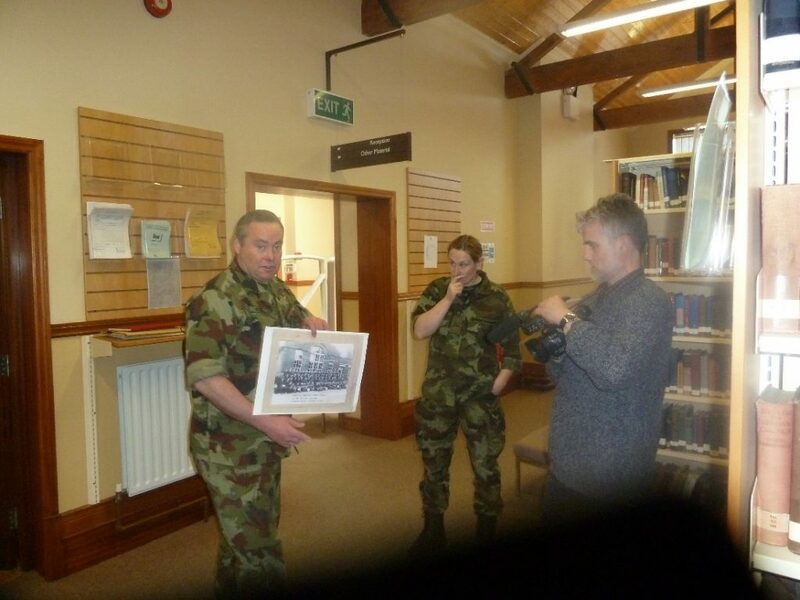 The tutorials in draft form were circulated to the Students, Instructors and Library Staff in the Defence Forces. Feedback was requested to ensure that: (1) the software chosen was suitable for remote user access (2) tutorials supported the primary information literacy needs of the end users as identified early on in the initial consultation meetings (3) Final suggestions on content can be included. It is envisaged that this tutorial will be launched in August 2016 and that these tutorials will be expanded further beyond the lifespan of this project. IT Carlow Library would like to acknowledge the work of our colleagues in the Defence Forces, advice from library colleagues in IT Tallaght and Cranfield University, advice from IT Carlow colleagues in IT Services, School of Sport, Media & Marketing, Faculty of Engineering and the Teaching and Learning Centre.